What’s for dinner? Unless you’re living on the Biggest Loser ranch where every meal is made for you, it’s a choice people have to make every day. Eat this, not that. Hit the drive-thru or cook at home? You know the drill, right? Every food choice you make has a cumulative effect on your overall health. And for the typical American, convenience often trumps healthier food choices. And that’s a problem the U.S. Department of Agriculture wants to change. 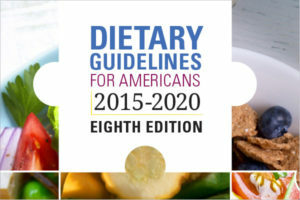 The USDA recently published the new 2015-2020 Dietary Guidelines for Americans. Boil it down to the basics, and people should be eating more fruits, vegetables, and whole foods, and a lot less sugar and processed foods. Follow a healthy eating pattern (like the Mediterranean Diet). Eat more nutrient-dense, unprocessed foods. Avoid or limit alcohol and foods with added sugar, saturated fat, and salt. Make small changes to your eating habits a little at a time to improve your diet. Provide healthy food choices at home, school, work, and community settings. Eat less sugar. This was just a general recommendation in the previous guidelines. The new guidelines put a cap on the amount of sugar people should eat. No more than 10 percent of calories per day should come from sugar. For the average adult, this caps sugar consumption at 50g per day. This could be tough to follow for a lot of people. A typical 16-ounce bottle of soda contains about 40g of sugar. And sugar is found in a long list of other foods like sweets, sauces, salad dressings, cereals, and yogurt. Control cholesterol. The previous guidelines recommended limiting total cholesterol to no more than 300mg per day. The 2015-2020 guidelines don’t have a cap on cholesterol, but suggest limiting cholesterol and saturated fats for heart health. Some health professionals consider this a controversial position. People with high total cholesterol have approximately twice the risk for heart disease, according to the Centers for Disease Control and Prevention. Eat healthy fats. People should eat no more than 10 percent of calories from saturated fat. This is the same as the previous recommendation. However, the 2015-2020 guidelines take this a step further and recommend eating healthy fats such as fish, nuts, seeds, and oils. It’s no secret that fad diets fail. Most are based on highly restrictive eating habits that just aren’t sustainable. The 2015-2020 Dietary Guidelines for Americans recognize that taking small steps to improve eating habits is the best route to a healthier population.